A few weeks ago for Collin's cousin Alison's bridal shower I made a four layer lemon cake with raspberry filling and lemon meringue buttercream with a coconut coating. I have to say, I think this was my finest work to date. Just in terms of sheer scale and impressiveness. I haven't ever attempted anything quite so large. It temporarily satisfied my desire to make a huge and ornate wedding cake that probably wouldn't have ended so well since I've never done anything close to that...until now that is. It was really fun to make and no problems occurred which was surprising and very reassuring. I got the recipe here and although it was delicious and certainly grand, I would change a thing or two next time. I didn't want to veer from the recipe too much since I didn't want to tempt fate, but I was a little disappointed that the cake wasn't coconut, nor that the frosting wasn't coconut either...I'm a little obsessed with coconut. The lemon frosting tasted great, but the meringue texture was a unsettling. Like grocery store cake frosting. Maybe this is what they use? 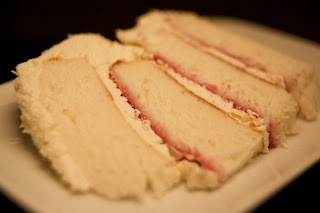 It wasn't cloyingly sweet which was a relief because the cake itself was, so they balanced each other out nicely and with such a large slice, no one could have handled anything sweeter. 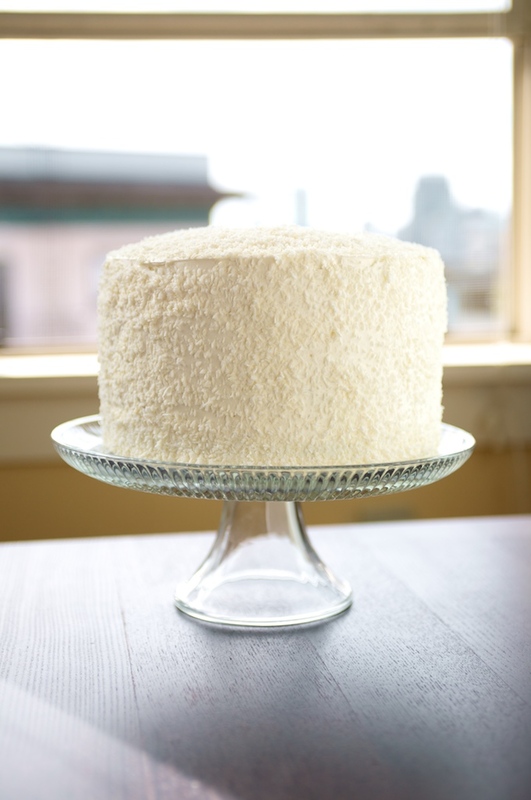 After it was frosted, I dusted the whole thing with a fine shredded coconut that I tossed in some powdered sugar to sweeten it. There were 20 or so guests, so I had Collin mock up a circle cut in to 24 even slices and used that to figure out how to cut the towering, thin slices. They were pretty with four layers but slightly too tall. We almost needed dinner plates to put them on. Never the less, for a bridal shower it didn't seem out of place. What shall I strive for next? May have to trick someone in to having me make them a wedding cake. Can you give me any advice about making/finding yummy treats that are dairy, gluten, wheat, and corn product free? (not all are dairy free too though I don't think-have to search for that). As a consumer of this tasty cake blogged above ... I can truely say it was an amazing cake and I really enjoyed it as made. However, as you mention the more coconut usage I can see your point in how it could have been even better. Maybe the frosting wouldn't have been so "unsettleing" as you put it if the cake itself would have been coconut. Nonetheless, great find! I agree Lacey, I think it needed to be balanced out with a bit more coconut. Can never go wrong with more coconut. For once I reigned myself in in that department! Wow, that is a stunning cake! Gorgeous! 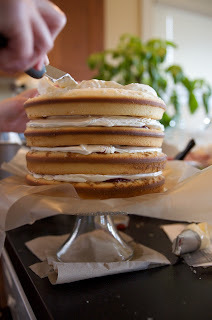 I never make four layer cakes for fear of the mess when it all falls over, but I may have to change my mind, it just looks so good! 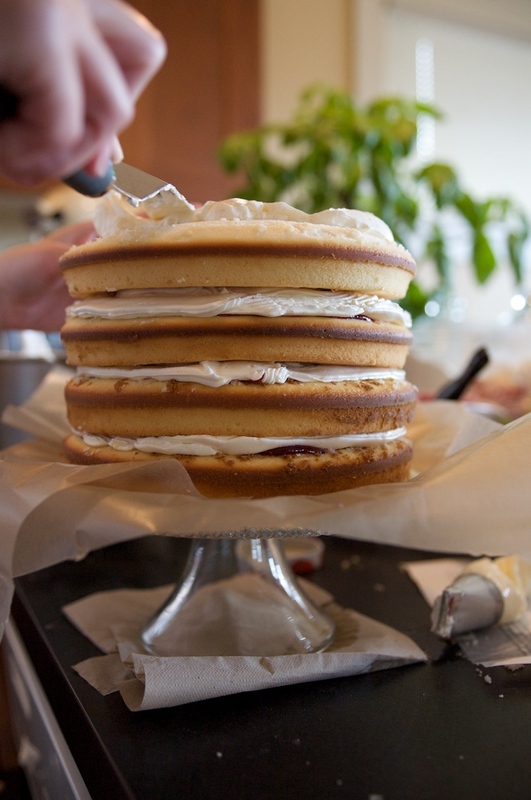 A trick my grandmother used to keep her two layer cakes from sliding was to put four toothpicks around the cake at 12, 3, 6 and 9 o'clock. Pushing them down, until it connects the two layers together. It worked really well, just make sure you remind whoever is eating the cake that their piece may have a toothpick and to be careful. 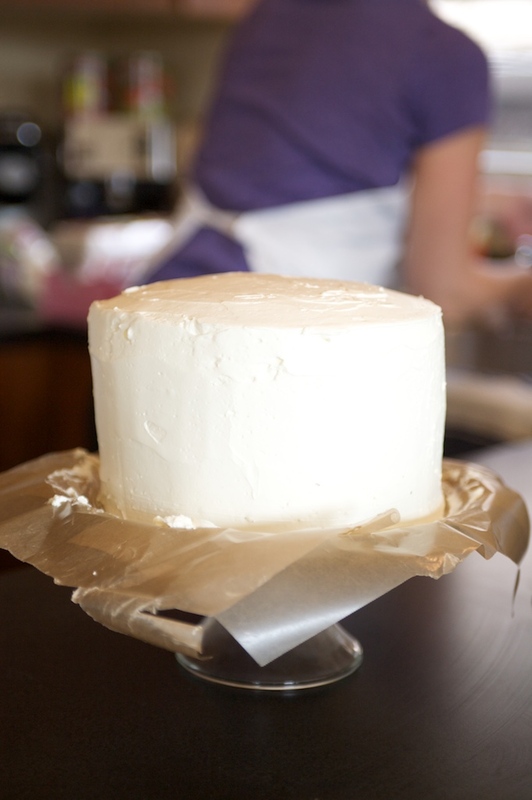 Once we got use to it anytime she made a layer cake we looked for the toothpick before eating out piece. Pulled it out and enjoyed the cake! It helps even more if you use the colored toothpicks, because they stand out more. Thanks Elizabeth! You definitely should give it a try! It's easier than it looks. Great tip Anonymous, I will have to try that next time! I always see the professionals using small dowels etc. to stabilize their cakes but toothpicks are a much better idea for non-professional purposes. Thanks! To cut a cake this size place a saucer directly in the middle and cut around it. Leave it in place as a guide to cut perfect square pieced straight down that fir on a snack plate. More like baby shower size. Biochemist and Baker. Would love to call myself a proprietor someday (mainly just because I love that word).